If you fail to fill out these forms your appointment might not be guaranteed. Please read before your First Clinic Appointment!!! For your first consultation, please bring all the products that you are currently using on your skin, including skincare products and makeup. It will help us determine which products are working for your skin and which are the ones that not beneficial for your skin type. 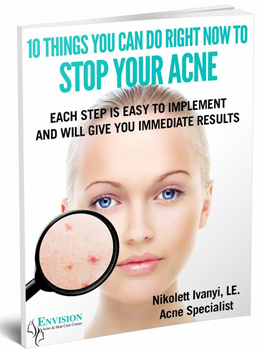 Acne Clients: If you have been currently taking any topical or oral prescription medication for acne we require you to stop using them 1 week prior your first treatment. We have found that they make the skin much too sensitive to use with our system. Therefore, we generally do not recommend the use of any of them with our regimen. Two weeks prior to your first treatment please avoid chemical peels of any kind and don’t get any facial waxing done 7 days prior. – For our teen acne clients between the age 12-18 the parent/guardian must complete the Teen Client Agreement form before their first treatment. – Children under the age of 12 may not receive a treatment without prior approval. Medical Conditions and Allergies: When scheduling your treatment, please let us know if you have any physical ailments, medical conditions, or allergies. It is imperative that you let us know if you are pregnant, have high blood pressure, a heart condition, or any other medical condition. We will personalize your treatment to meet any special needs or accommodations.